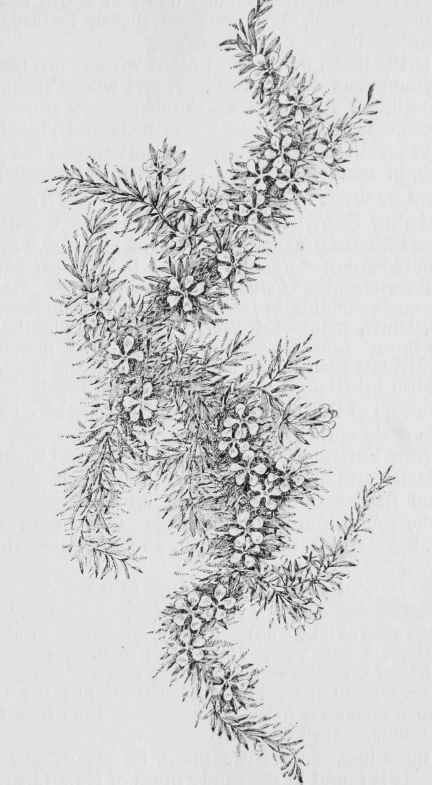 Pyxidanthera. barbulata ("a small box," and "anther," because the anthers open as if by a lid). - Family, Diapensia. Color, white, or sometimes a pale rose. Sepals and stamens, 5. Corolla, 5-lobed. Flowers, small, sessile, many on short, leafy branches. Leaves, very small, narrowly lance-shaped, like the leaves of moss plants, somewhat hairy. Pine barrens from New Jersey to North Carolina. April and May. This moss-like, dear little plant is one of our earliest flowers. It is found in the sandy pines of New Jersey, south to North Carolina, creeping on the ground. Flowers sessile, small, on tiny branches, on which grow the needle-like leaves. Plucked and kept well covered with water, it will retain its freshness many days. It is a great delight to come across the pyxie when yet flowers are few.